It’s one of the essential ingredients of boat noodle soup – the blood thickens the broth and basil takes away the iron flavor. making me drool now. Since locals love eating there, sure the food is good. I want to go where the locals actually eat so it was quite a nice surprise to bump into this small shop selling boat noodle soup. The real thing? Anything like the one(s) in KL? 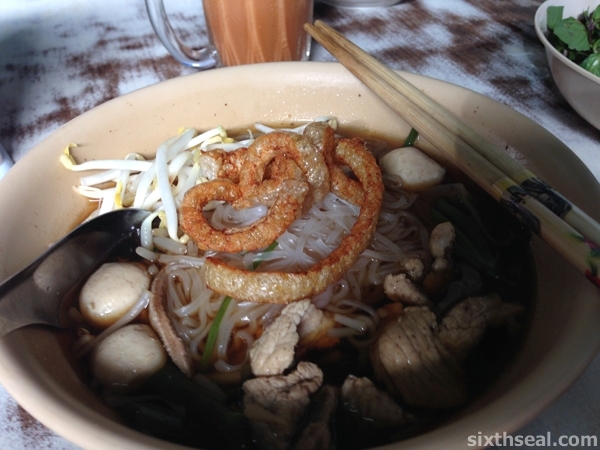 Boat noodle soup comes from Thailand, I had the same thing in Bangkok too. The locals don’t eat so much though, maybe just 2-3 bowls. 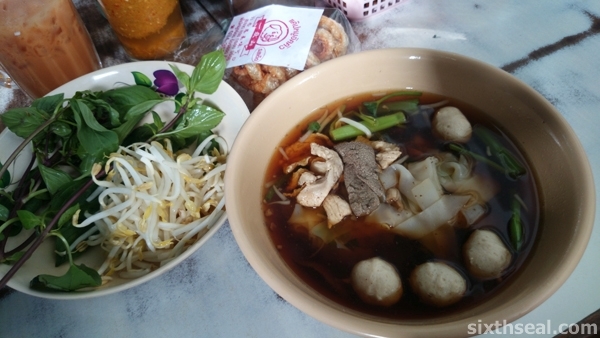 The two things which makes an authentic boat noodle soup is out of the equation, which makes it a poor imitation of the real Thai boat noodle soup. I know there are places here which serves it with pork liver and blood though but I haven’t tried them. Looks good, especially with the meatballs and pork liver.. Anything with pork liver, I’m in.. The soup looks really rich, very “yap mei”, did you slurp all the soup? Or was it too salty? If me, same style.. One bowl of noodles, and another bowl of “liew” (and soup) only, best !!! It’s soooo nice – they actually thicken it with blood but you can’t taste it so much coz they use basil and other herbs to cover up the iron aftertaste. It’s not salty at all and I was surprised to find all five tastes in there – bitter, sour, sweet, salty, umami. I love the condiments they have too – sugar (!!! ), crushed peanuts, and chilli flakes. It makes the soup extra yummy! 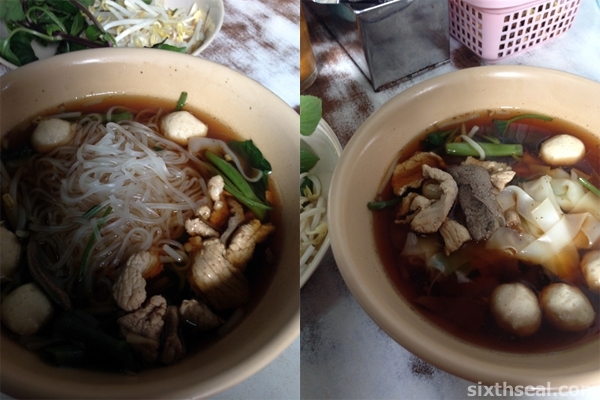 The secret to Thai boat noodle soup is in the broth. It only averages 2-3 heaped spoonfuls per bowl for this shop but most people just eat 2-3 bowls too. We ate one each coz we wanted to eat other things. I love this stall – they have so much stuff inside – meat, pork liver, meatballs etc and the pork rinds are made by themselves! It definitely caught my attention, that’s for sure. 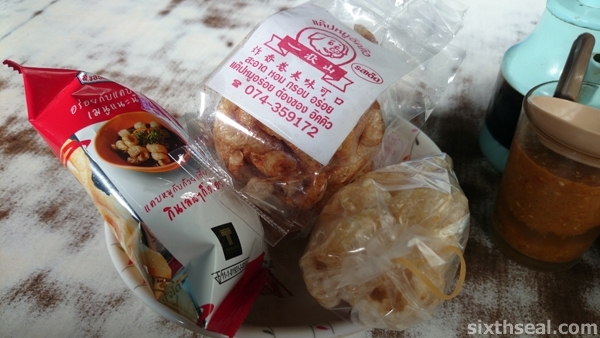 They make their own pork rinds but they carry other brands too, from commercial ones (like the nicely packaged pork rind with images and instructions to put it into Thai boat noodle soup – traditional way of eating it) to their own brand (which is loosely tied with nylon string). Hmm…good question! I don’t think I personally can eat a lot though. Haha! I can eat a couple of packets but that’s it, it’s too rich a snack to eat in bulk. It would be interesting to see a pork rind eating contest though. Now that you have eaten the authentic boat noodle, I don’t think you will need to try those super small bowls of boat noodle here. 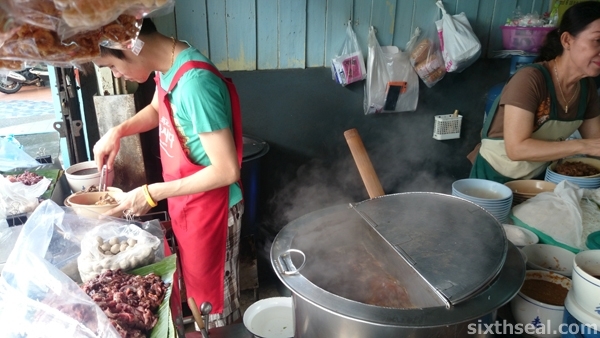 I have tried 3 shops selling boat noodles in Kuchai Entrepreneur Park and I can say not too bad because the ones I tried also uses blood and pork liver in the noodle and from the many local Thais visiting the eateries, I guess they are quite close to the authentic version. Are there really halal boat noodles in KL? Boat Noodle in Empire Damansara is one of them. They also have branches in Jaya One and Publika. I’m not sure if they got their halal certification already but they’re aiming for that and when I went it was pork free and lots of Malays were working and eating there. It’s not authentic at all, they use chicken and beef and of course, there’s no blood to thicken the soup. 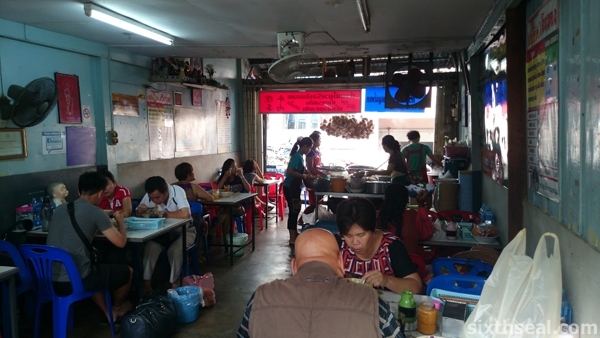 The restaurants are operated by Utara 5 Food & Beverage Sdn Bhd and it’s famous for the RM 1.90 noodles – the original outlet was always packed with Muslims since it’s pork free and it targets people who doesn’t know better and couldn’t eat pork or blood. You’re lucky to try the one in Kuchai! I’ve heard good things about them, they’re authentic if they use pig liver and blood in the soup and I would love to check it out. I will one of these days. Thanks Mun! :) I’ll bring my better half to see the Kuchai one and how it fares compared to the ones in Bangkok and Hat Yai. It must be good since the Thai community in Malaysia goes there. Oh, I did not know that the mini bowls boat noodle that started it all in KL in Empire Damansara does not serve pork. Not very authentic then but I guess they want to tap into the bigger community who cannot eat pork, more business for them. 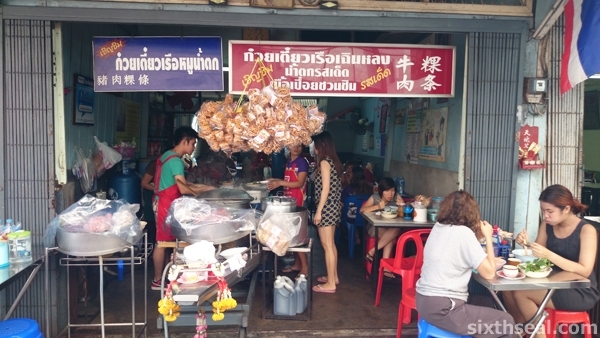 There is another shop selling normal size boat noodle in Kuchai but I have not tried that one yet. I’ll love to try the first one, it’s fun to eat mini bowls although a normal size boat noodle soup would be cheaper if they only put 1-2 spoonfuls in the former. There are more decently sized portions in Thailand – the shop in this post had about 2-3 heaped spoonfuls of noodles and a large amount of meat. Yeah, it was the commercialized Boat Noodle that’s the halal/pork free one and always packed with Muslims. I guess it’s a good business model since they can get Malays to come too and they certainly seem to be doing well. I just won’t ever go there again coz it’s not as nice as the boat noodle soup in Thailand that uses pig liver and blood and it’s not authentic.